OxyContin is in a class of drugs called narcotic analgesics. It is a pain reliever. 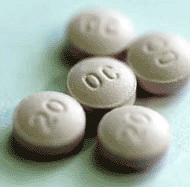 OxyContin is used to treat moderate-to-severe pain. OxyContin, approved by the FDA in 1995, is an opium derivative that contains the same active ingredient as Percodan and Percocet. OxyContin is intended for use by terminal cancer patients and chronic pain sufferers. OxyContin is designed so that the oxycodone is slowly released over time. OxyContin is an opiate agonist. Opiate agonists provide pain relief by acting on opioid receptors in the spinal cord, brain, and possibly in the tissues directly. Opioids, natural or synthetic classes of drugs that act like morphine, are the most effective pain relievers available. OxyContin is manufactured by modifying an alkaloid found in opium. OxyContin is a central nervous system depressant. OxyContin's action appears to work through stimulating the opioid receptors found in the central nervous system that activate responses ranging from analgesia to respiratory depression and euphoria. OxyContin abuse is spreading for a variety of reasons. First, the elevated opiate dosage makes it highly addictive. Second, in contrast to drugs such as cocaine or heroin that can be laced with other substances, with OxyContin you know how much of the drug you are getting. Since the dosage is consistent, it delivers a dependable high. Finally, OxyContin is covered by most health insurance plans, so it is significantly cheaper than street drugs. OxyContin abuse and addiction is becoming a wide spread problem in America. OxyContin is a leading treatment for chronic pain, but officials fear it may succeed crack cocaine on the street. The DEA says it is only a matter of time before every community in the country is confronted with the problem of OxyContin addiction. No prescription drug in the last 20 years has been so widely abused after its release, federal officials say. Physical addiction to OxyContin which is sometimes unavoidable develops when an individual is exposed to OxyContin at a high enough dose for an extended period of time. The user's body adapts and develops a tolerance for the OxyContin. This means that higher doses are needed to achieve the drug's original effects. OxyContin mimics the action of chemicals in your brain that send messages of pleasure to your brain's reward center. It produces an artificial feeling of pleasure. OxyContin is able to produce pleasurable effects by acting like normal brain messenger chemicals, which produce positive feelings in response to signals from the brain. The result is of the predictable drug which, short circuits interests in and the motivation to make life's normal rewards work. More and more confidence is placed in OxyContin while other survival feelings are ignored and bypassed. The result of this addiction cycle is a lack of concern for, and confidence in, other areas of life. Symptoms of an OxyContin overdose includes slow breathing, seizures, dizziness, weakness, loss of consciousness, coma, confusion, tiredness, cold and clammy skin, and small pupils.